​In March of 1832, Captain John Barber brought his wife Emma and their four children, Royal Edward, Mary Emeline, Eunice Caroline and Ruth Marie, from Rutland County, Vermont through the Erie Canal to Old Fort Dearborn in Chicago. Traveling on the same boat with the family was General Scott's army - on a duty assignment to fight Chief Blackhawk in the Sac War. 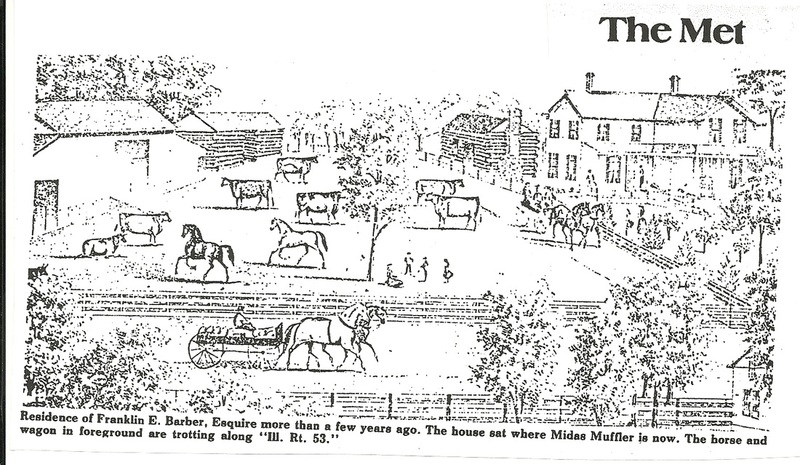 ​Members of the family volunteered their time to establish a rural community, among other things chartering the First Presbyterian church in 1833 and founding the DuPage Township Post Office at Barber's Corners. John and Emma Barber are buried in Boardman Cemetery on Paxson Road, just north of Royce Road. "Barber's Corners" was listed on Illinois road maps until 1975 and has been commemorated in three locations. The Bolingbrook Historical Society (now the Bolingbrook Historic Preservation Commission) placed an informative plaque* near what was then Central Federal Savings (now First Midwest Bank) in September 1979. In addition, the Bolingbrook Board of Trustees named the street from Taco Bell to Lube Pros (then Wendy's and the old village hall) "Barber's Corners Road." This intersection of Route 53 and Boughton Road, known as Barber's Corners, was never an incorporated municipality. It was named after the John Barber family who came here from Vermont in 1832. Over the last century and a half there has been at this corner a general store, Methodist Church, cheese factory, and one-room school house. It was twice the location of the DuPage Post Office. 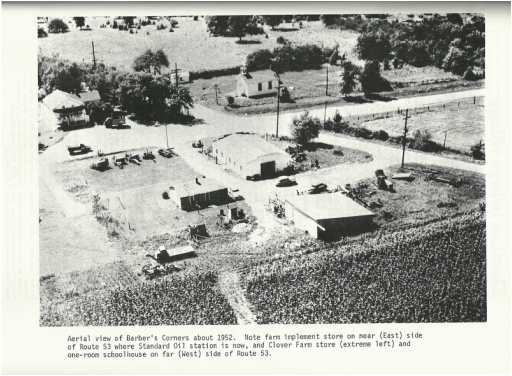 Barber's Corners served the needs of the people in this area for decades, long before Bolingbrook was incorporated in 1965. This plaque is to insure that this part of our history endures, even though the name may disappear from the map. ​Pictures and information above excerpted from Bolingbrook Has Even More History, Vol. 2, Compiled by James D. Bingle for the Bolingbrook Historic Preservation Commission. Articles which were used for the above are from The Met and authored by Judy Bredeweg, a charter member of the Commission, and by an unknown staff writer for The Met. 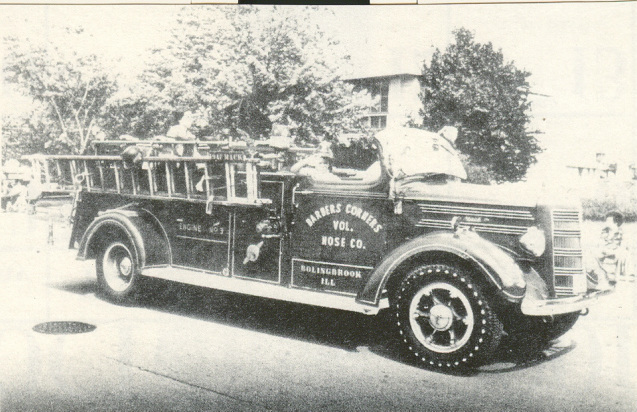 Old fire engine picture from archives of Bolingbrook Historic Preservation Commission. 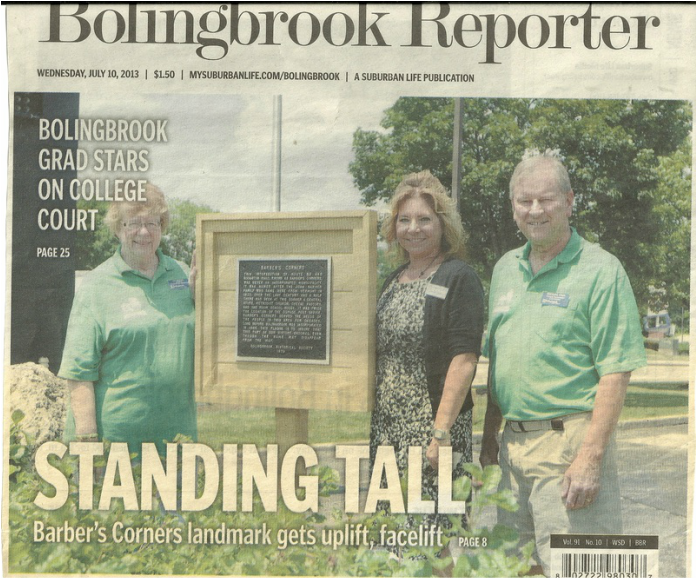 Recent article from The Bolingbrook Reporter announcing landmark restoration. Bolingbrook's oldest historic marker now has a new look. A collaborative effort by the Bolingbrook Historic Preservation Commission, Bolingbrook's Public Works Department and First Midwest Bank, the Barber's Corners landmark - near the intersection of Route 53 and Boughton Road - recently was refurbished and redesigned to increase pedestrian visibility. The engraved placard - which details the excursion of John Barber, one of the area's original settlers - previously was situated atop a knee-high boulder in the First Midwest Bank parking lot but now rests prominently on a 5-foot tall post, peering out toward the bustling intersection. The restoration long was overdue, said Historic Preservation Commission Chair Bill Kohl, explaining the landmark had not been touched after it was completed in September 1979. He said seeing the landmark from the street and sidewalk was the driving force behind the renovations. 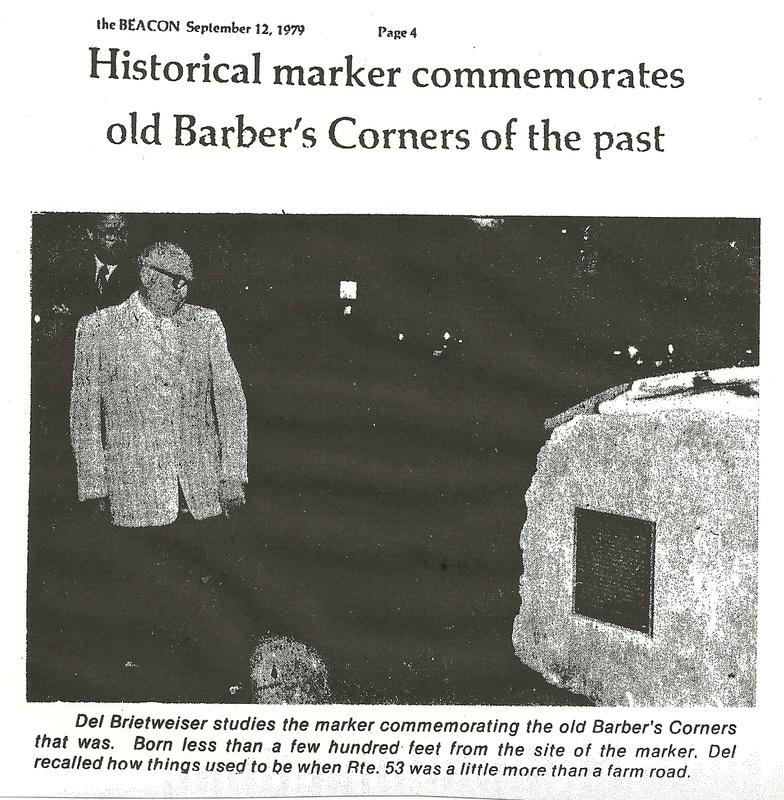 "A lot has changed since the Barber's Corners landmark was first built in 1979," Kohl said. "The landmark has withstood harsh winters and a growing retail community. But before the restoration, it could not be seen outside the parking lot." Earlier this year, the Historic Preservation Commission approached First Midwest Bolingbrook Bank Branch Manager Amy Monahan about restoring the monument. The bank obliged, funding the $160 renovation cost, Monahan said. The monument was tarnished, chipping and difficult to read, Monahan said. "First Midwest Bank and the Historic Preservation Commission agreed that, most importantly, it should be seen from the street. It is great exposure for both parties and provides nice historical insight about the village's past," she said. Barber's Corners predates the village itself. In 1832, when John Barber, his wife, Emma Barber, and their four children trekked west from Vermont, they laid claim to 211 acres of land on the east side of Route 53, eventually founding a rural community and establishing the local First Presbyterian Church in 1833. Over the past century-and-a-half, the corner has transformed from a general store to a Methodist Church, a cheese factory, a one-rooms schoolhouse and a bank. It twice was the location of the DuPage Post Office. Before Bolingbrook was incorporated in 1965, the surrounding area was marked on maps by one thing: "Barber's Corners." While Barber's Corners is surrounded by retail and shopping centers, it will remain an appealing stop for a five-minute history break," Kohl said. Historic Preservation Commission member and former chairwoman Judy Bredeweg believes that during an era of rapid change, the Barber's Corners landmark forever will remind residents of their roots. "We built Bolingbrook from farmland and dirt and gravel roads," Bredeweg said. "Barber's Corners is an important reminder of our past, and now it can be enjoyed by present and future generations." For more information about the plaque and Barber's Corner, see information above.